The science and innovation behind this project is the driving force which led to it’s success. The dynamic nanoscale molecular environments in Riding Snowflake sand Molecules to the MAX! are derived from accurate, state-of-the-art molecular simulations. The location, movement, and trajectory of each atom in these shots were painstakingly simulated by Dr. Shekar Garde’s team of researchers at Rensselaer. 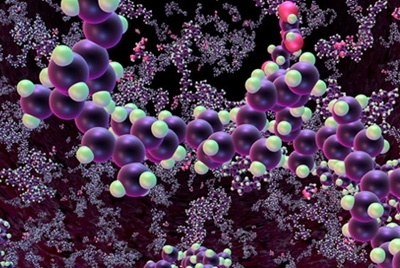 To create believable nanoscale immersion required simulations of massive scale and complexity. Visualizing the plot twists of the story within accurate simulations posed a host of new creative challenges for the collaborators that led to the invention of many creative simulation strategies by the Garde Team. Translating massive amounts of atomic simulation data onto the giant screen posed unique technical challenges for Nanotoon’s animators. 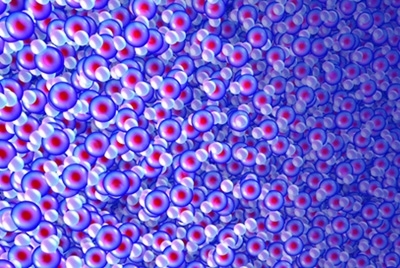 To process and render the millions of atoms in most scenes required the invention of new procedural animation techniques to create the ultra-high resolution frames of Molecules to the MAX! and Riding Snowflakes. Justin Rosen, Nanotoon’s Technical Director developed a custom conversion software within the Autodesk Maya API that allows the massive simulations to be instantly and flexibly visualized. The result is atoms and molecules rendered in cinematic realism, with reflections, refractions, lighting, motion blur, and atmospheric volume. With this new simulation/animation hybrid, we can now reveal the nanoscale universe as never before visualized. In 2004, when Riding Snowflakes went into production, the digital “fulldome” projection systems were in their infancy. 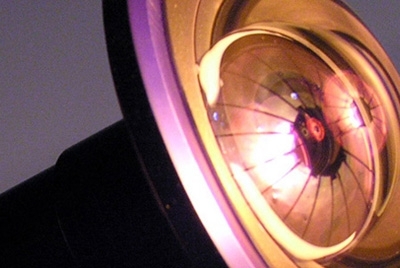 The development of single projector systems with an Omnifocus™ lens radically reduced cost and complexity, and created a rapidly growing number of small digital-dome systems worldwide. Molecularium – Riding Snowflakes was developed in a digital dome with a single lens projection system. Inspired by this innovation, the Molecularium team developed its counterpart: an omnidirectional fisheye lens for a virtual camera. The omnidirectional camera captures an entire immersive world in a single frame. This is a significant innovation, as it allows for streamlining and ease of production in the emerging digital-dome medium. In creating the soundtrack for Molecules to the Max! a number of innovations were made in the realm of sound spatialization. 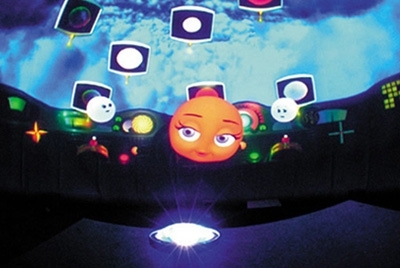 As the characters and objects fly throughout the immersive CG environment that is presented onscreen, their voices and sounds move to corresponding positions in the giant screen (e.g. IMAX) surround sound-field. 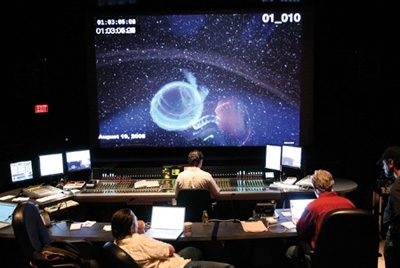 Sound designer Jesse Stiles collaborated with the Lead Technical Director, Justin Rosen, to create the “Space-o-Matic” system in which the animation platform Maya automatically passed location information of objects and characters to the sound spatialization system. Using the “Space-o-Matic” allowed for the sounds in the film to be automatically spatialized in realtime with a high degree of position accuracy.